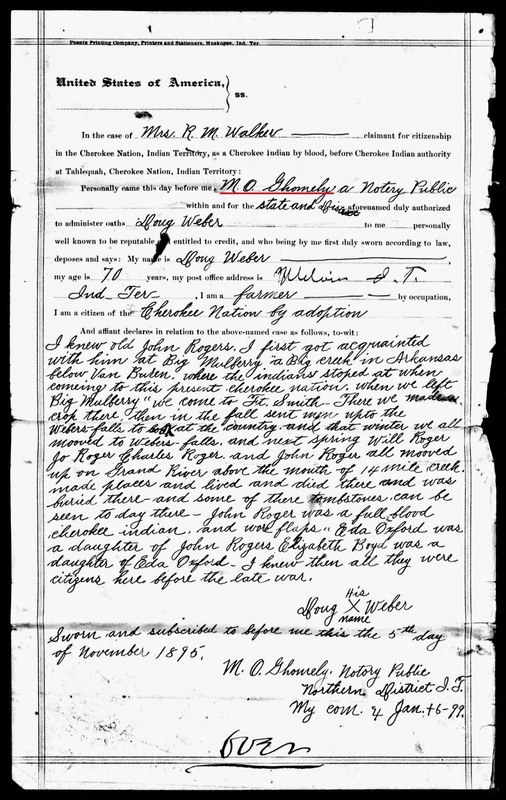 John R. Gourd (sometimes called Rattlinggourd) and Doog/Dug/Doug/Duge Webber made affidavits in the citizenship case of Chief Baker's maternal ancestors. These men were standing witnesses, or professional witnesses, meaning they would, for a fee, testify to anything a person wanted. The reputation of standing witnesses was bad and reputable Cherokees testified to that fact. C.W. 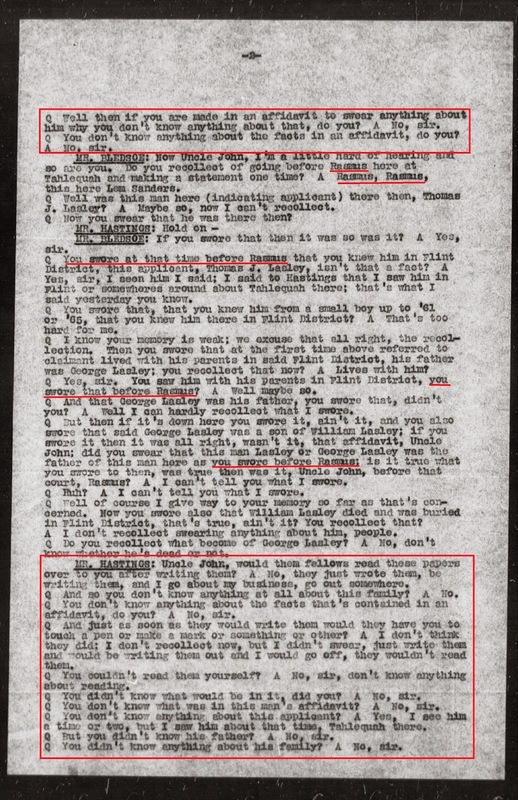 Starr, the ex-chairman of the Senate Committee on Citizenship for the Cherokee Nation, swore that he knew the reputation of J.R. Gourd and Doog Webber (among others) and it was bad and the men were known as Standing Witnesses in citizenship cases and Starr would not believe them under oath. 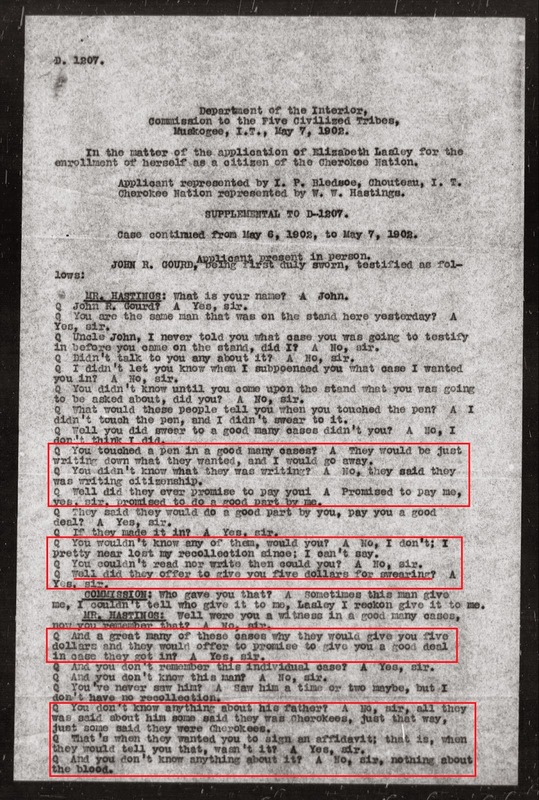 Later, in a disputed Dawes enrollment case (D1207), John R. Gourd explained how the standing witness scam worked in his experience. Gourd didn't know anything about the people or the family, other than he might have seen them in the past. William F. Rasmus would tell Gourd the people were Cherokee and then would write what he wanted on the affidavit without John R. Gourd knowing what was stated. Rasmus would put Gourd's name on the testimony. Gourd would be paid $5 and promised more if the case was approved. While the above testimony by Gourd was not given in the RM Walker case, it still applies because it shows the unethical practices of William F. Rasmus. 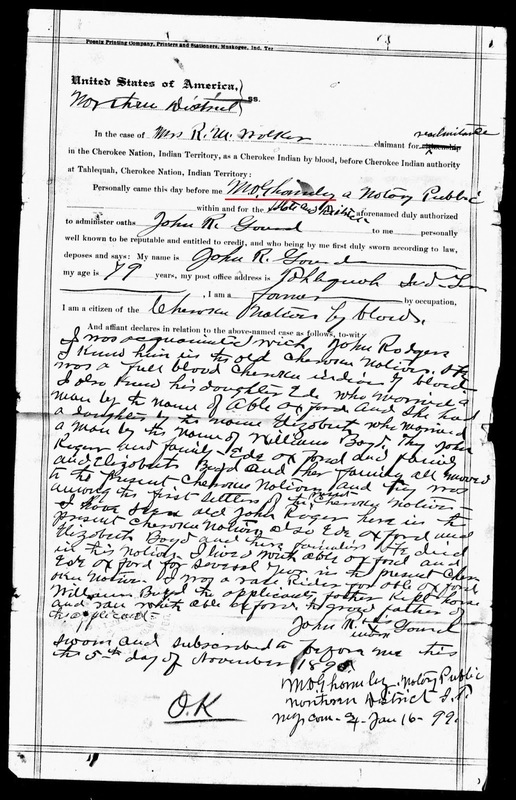 William Boyd, Chief Baker's maternal great grandpa, tried to fraudulently obtain Cherokee citizenship. Who were the lawyers handling William Boyd's case? The above mentioned William F. Rasmus and his partner, M.O. Ghormley. Rasmus and Ghormley submitted 12 applications and 13 pages of evidence in the RM Walker case. Notice above, in the paid testimonies given by Gourd and Webber, M.O. Ghormley* was the notary public who signed that the testimonies were sworn before him. Rasmus* was the lawyer Gourd testified about, the one who wrote down whatever he wanted, while Gourd went on his way. Was John R. Gourd a victim in this? Was he taken advantage of by unscrupulous lawyers? Maybe, but that isn't the point. The point is there are a lot of fraudulent affidavits in those old rejected citizenship applications. Whether Gourd or any of the others were taken advantage of doesn't matter. 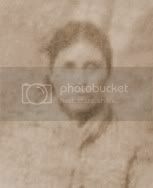 What matters is the standing witnesses accepted payment and allowed their names to be put on many fraudulent affidavits that are now cited by novice researchers as proof of Cherokee ancestry. 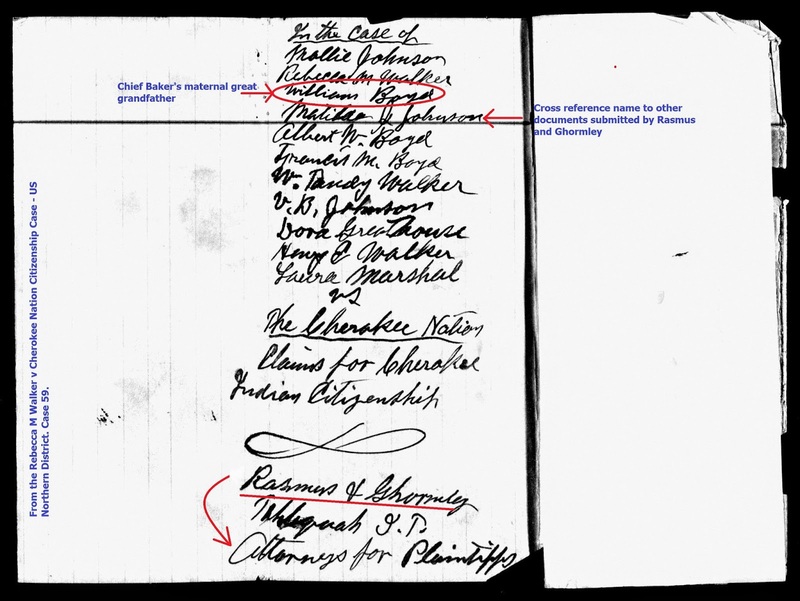 Additionally, this shows that non-Indians were willing to bribe witnesses in their attempt to gain citizenship into the Cherokee Nation. Chief Baker's maternal ancestors were among the people who tried to do that. 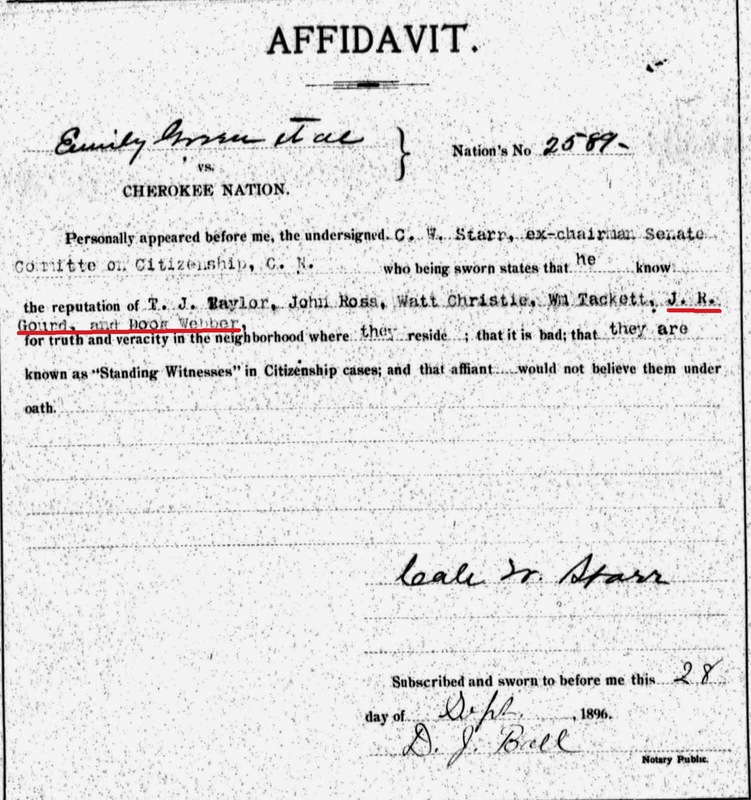 Sadly, despite the fact his maternal ancestors were not Cherokee; despite the fact his maternal ancestors used lawyers who were willing to perpetuate fraud; despite the fact his maternal ancestors used standing witnesses, Chief Baker and his family still claim they are Cherokee through his maternal line. 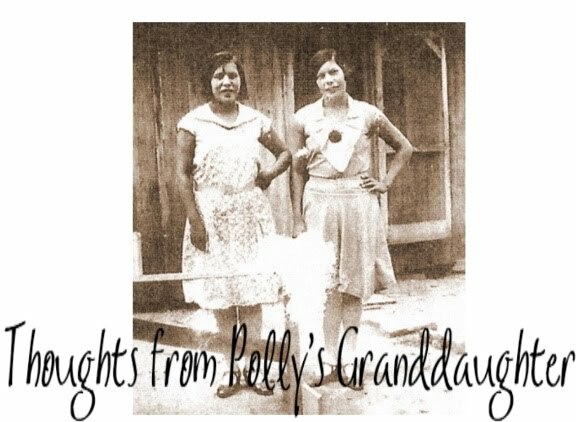 ** Because of those continued claims despite all the evidence to the contrary, it is not a stretch to believe Chief Baker's fabricated maternal Cherokee ancestry has a strong influence over the decisions he makes for the Cherokee Nation today. Any Cherokee who cares about our sovereignty should be concerned. Stay tuned for the next installment in the series, When the Past Meets the Present - Motivation: Is a good deed really a good deed? * M.O. Ghormley was Cherokee by blood. Rasmus was an Intermarried White. Both were listed on the Final Dawes Roll. Great job!! Keep it up!! Thanks for the information. Very nice! 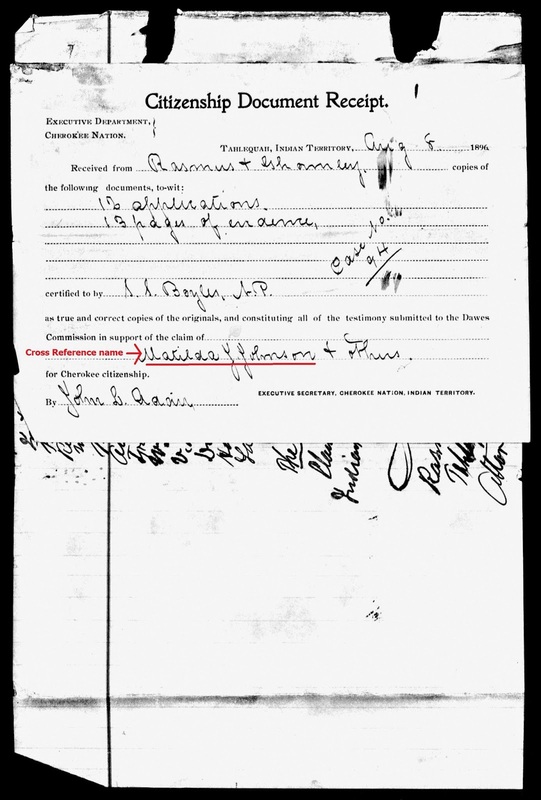 John R. Gourd was a witness on my own ancestor's 1896 application. And in light of your information, it does seem to invalidate his testimony since he was a known "standing witness". However, there is something very beneficial that can come out of the affidavits. They contain lots of genealogical data that can be used to back up your research. But, as for the Cherokee part, you need other documents to substantiate your claims...as it should be.